The main house boasts superb self catering holiday accommodation with three bedrooms and two spacious reception rooms consisting of an entrance/dining area, a large sitting room, big fitted kitchen and utility room with washing machine and dishwasher. Rectangular shaped (29 sq.m/312 sq.ft) with wooden staircase leading to the bedrooms and bathroom. Large French doors to the garden. The floor is traditional "tomette" tiles with a large rug. Big solid refectory table with wooden bench seating. Also rectangular shaped (29 sq.m/312 sq.ft) with three piece suite, TV and DVD player. French doors to the patio area to the side of the house. The floor is also traditional "tomette" tiles with large rugs. Large dining table and six chairs. Large rectangular kitchen (22 sq.m/236 sq.ft) with fitted units and gas oven and hob. Fridge/freezer. The floor is wood and there is a door to the outside. Size 5.7 sq.m/61 sq.ft with washing machine and dishwasher. Upstairs there is a bathroom with shower, one bedroom with two single beds, one single bedroom and the master bedroom with double bed and an attractive wood panelled sloping ceiling. Heating is available through electric radiators. Carpeted bedroom with wood panelled sloping ceiling. Size 15 sq.m/160 sq.ft. Small window and double bed. L-shaped carpeted room (9.7 sq.m/104 sq.ft). Two single beds with window. Carpeted room (8.8 sq.m/94 sq.ft). Single bed with window. Large wash basin with mixer taps and large mirror. Thermostatically controlled shower. Toilet. To reserve the main house click here. 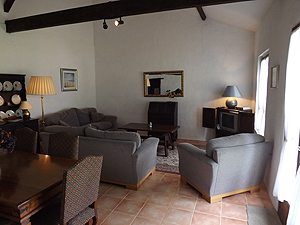 To view the adjacent self contained gite click here.